I posted a comment on this question (answers now deleted) saying that out-of-the-box solutions for placeholders in UITextViews don't exist, but that there are libraries out there doing the job. As it's an open source library, there's no point in promoting it in any way. I was just trying to get OP help with their issue. It had two flags on it. In total you left two comments under the question and three comments under one of the answers. Basically saying it can't be done unless you use something like my library (linked) and then criticising one of the answers. There was a flag on another of your comments under one of the answers. The other users felt you were pushing your project and bullying them for posting answers. To be honest I was torn about whether to mark them as helpful or not. I made the decision to mark them as helpful, as it was two independent people raising similar flags, and the comment was a little (mildly) dismissive, so I marked them as helpful. Either way it won't affect your account. If you were to accrue abusive/unkind flags so that an auto flag is tripped, we would review the comments and that comment is not enough to warrant a mod warning (this is the back end result of comment flagging). If I had dismissed the flag, I would have deleted the comment as no longer needed, as it really was plug for your own work (open source or not)and there were two answers under the question, so it wasn't really needed. To put it into perspective, there's hundreds of comment flags per day and if it's an edge case, sometimes it's impossible to make a call that will satisfy the community. As dismissing the flag can result in a meta post, deleting the comment can result in a meta post. The goal of the mod is to handle flags as expediently as possible and this is not black and white. The part of the comment "there is no out-of-box way to do that" seems hasty as there are some short answers, and even one-liners like [myTextView addSubView:myPlaceHolderLabel]. As the owner of the linked lib, Linus Geffarth could have shared the code as an answer instead of a link-only comment. If all the libs solving this question were advertised in separate comments, it would be flooded with link-only comments. 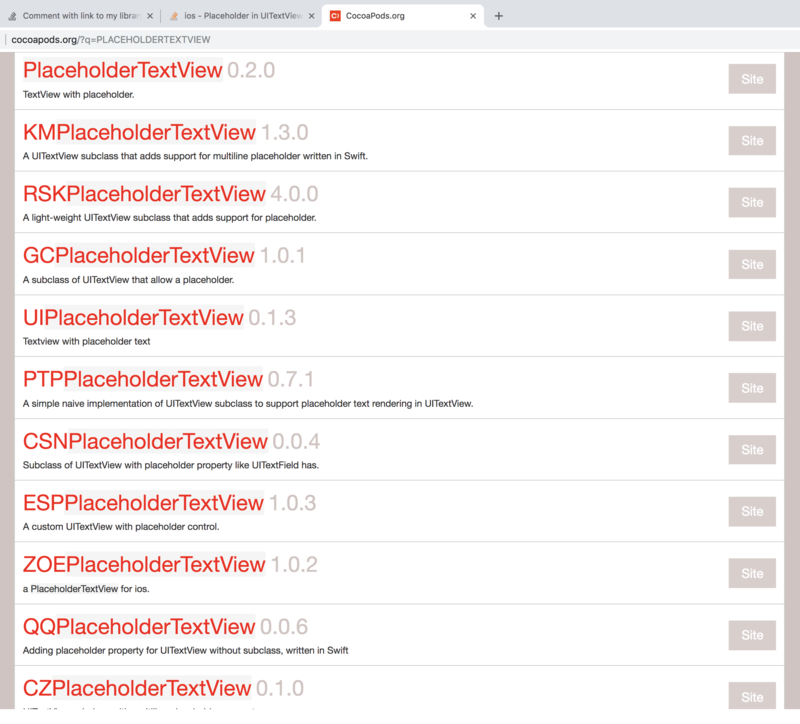 Better to link to an exhaustive list of libs, like https://cocoapods.org with the search term of "PlaceHolderTextView"
Not the answer you're looking for? Browse other questions tagged discussion comments deleted-comments self-promotion specific-comment . There are no Stack Exchange sites that allow asking for “OpenSource Library Recommendations”, shouldn't we make one?